Using Commercial Contracts: a practical guide for engineers and project managers examines how the law of contract operates, and the way in which the legal system interprets what a contract actually means. By giving clear, readable and expert advice on key legal issues, this guide provides the manager and engineer with an easily understandable and practical approach to the laws of contract. 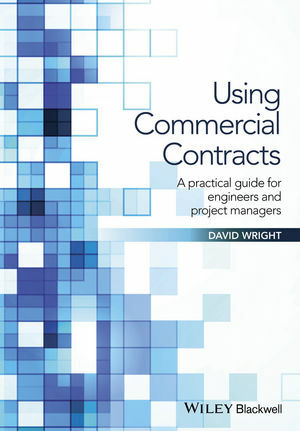 The author, David Wright, is a Consultant and lecturer on commercial contracts; also a Visiting lecturer at Manchester University and Sometime visiting lecturer and fellow at Cranfield University. David Wright left university with a good law degree. He worked as a commercial lawyer/manager/negotiator in the electrical industry then, successively in the electronics/avionic and defence industries, on the client's side of the off-shore oil industry, and the contracting side of the chemical/process engineering industries. Finally he spent three years at board level, in in charge of the contractual and commercial function, in a UK/communist joint venture process contractor, followed by a period as General Counsel in an electrical/mechanical engineering group of companies. Since then he has been a lecturer and consultant on contracts and related areas in the electrical/mechanical and process engineering industries He was a member for over seventeen years of the Institution of Chemical Engineers' committees which write the Institution's model conditions of contract for the process industry and supervise the approval, selection and training of arbitrators and adjudicators. He has taught at a number of universities within the UK in law, contract conditions, negotiation and contract/project management, including Cranfield, where he held successively a visiting lectureship and visiting fellowship in European Business Law, Leeds, Imperial College and Manchester University, where he has held a visiting lectureship for some twenty years. He is the author of the Purple Book, the standard Guide to the ICHEME model conditions of contract, a "Guide to Consultancy" and "Law for Project Managers". Finally he is an experienced arbitrator, mediator and adjudicator in the process industry.